Inspiration finally struck at around 75 miles an hour on Interstate 205 in Tracy, California. Justin had been after me for several days about putting some words on paper that would ultimately grace the back of our wine bottle and help carry our company’s message. I had scratched out a few drafts, but nothing was flowing. Finally on our way over to Richmond to meet with the bottle design company I took a deep breath, said a silent prayer, and let God write the words. I was nervous to put it out into the world. 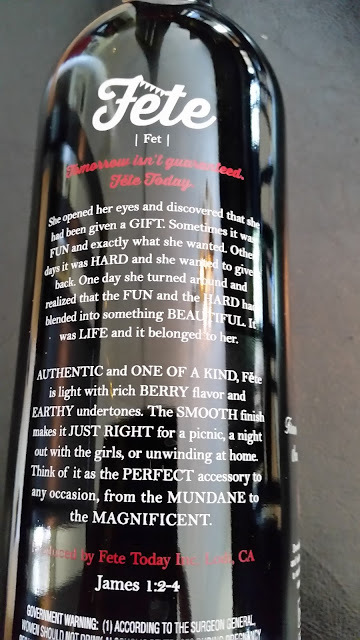 I know it’s just a couple of sentences on the back of a wine bottle, but it felt really raw and intimate and I didn’t really want to share it with anyone, let alone take credit for writing it. What if people thought it was dumb? What if they rolled their eyes and found it a bit over the top? Today our first wine bottle has been out in the world for 9 months and we are getting ready to start the design phase for our second bottle. Most of the time I feel grossly inadequate about this whole undertaking. We don’t fit the traditional mold of winemakers. Our wine is geared toward a very specific audience, and unfortunately that audience doesn’t have any “muscle” in the industry. We never had a deeply rooted desire to make wine, nor found the idea of living on a vineyard romantic and alluring. Today Justin went by one of the wine centers that sells our wine. One of the workers told him that she took a bottle home to her mom for her birthday because the whole concept of Fete seemed to speak to where her mom was at in life. She presented the bottle to her mom at her birthday dinner. Her mom read the back of the bottle and cried. Then her dad cried. Then her mom passed the bottle around the table so all her friends could read it. They looked up James 1:2-4*, the address of the Bible verse we had screen printed onto the bottle. They were all moved. By this silly little thing we put into the world hoping it would resonate and bring some light to those who need it. This is why we have a wine brand. This is why we have thrown our humble product out there against hundreds of other wineries with family history and clout. This is why we have chosen to target a demographic that the wine industry believes is only good enough for cheap products. This is why I force myself to swim against the undercurrent of desperation that is so prominent in most wine marketing to women – especially on social media. Life is a gift. YOUR life is a gift. Life, with its messes and letdowns and disappointments, IS a gift. Celebrate it. Fete today. *James 1:2-4: Consider it pure joy, my brothers and sisters, whenever you face trials of many kinds, because you know that the testing of your faith produces perseverance. Let perseverance finish its work so that you may be mature and complete, not lacking anything.